The Air Florida crash on Wednesday, January 13, 1982 is very well covered, from an aviation standpoint, on several aviation disaster websites that I have seen. I will discuss the ground transportation standpoint of this disaster, as well as the unrelated subway disaster that occurred about one half hour later. There was a major snowstorm that was covering the Washington, D.C. area with considerable accumulation, and there was an early release of federal employees, and heavy strain on the region's transportation system. The plane had taken off from nearby Washington National Airport, and due to wing icing and pilot error, the aircraft lost altitude and crashed into the 14th Street Bridge and the Potomac River less than a mile from the airport. There were only 5 survivors out of 79 people on board. The plane was a Boeing 737 two-engine jet airliner that was Air Florida Flight 90. 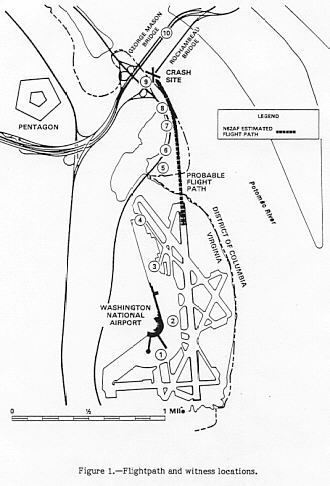 The aircraft descended nose-high and tail-low, and at 4:01 PM, the tail struck the deck and parapet of the Rochambeau Bridge (the northbound span), struck seven vehicles, killed 4 motorists and injured 4 motorists, and went into the frozen river between the Rochambeau Bridge and the express span (they are a couple hundred yards apart). The aircraft shattered the surface ice, and broke into multiple large pieces which quickly sank into the river. There were a total of 78 fatalities. Traffic was already stopped in a traffic jam, due to the storm. Between the effects of the storm, and the rescue efforts around the 14th Street (I-395/US-1) bridges, the 12-lane complex ceased to function, and closed to traffic. The George Washington Parkway, which parallels the Potomac River in Virginia, also closed near the crash site. 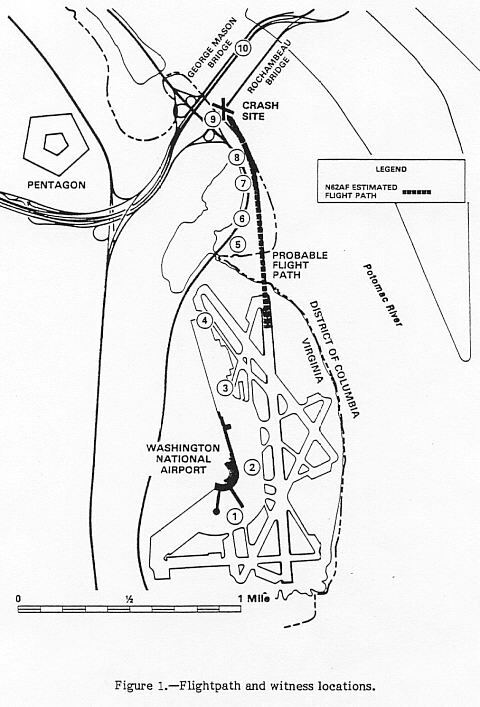 Map showing airport and flightpath, from NTSB accident report. Click for larger photo images: Medium (31K), Large (59K). A rapid rail transit accident occurred about one half hour after the air crash. At 4:30 PM, one car of a WMATA Metrorail train derailed while the train was being backed up through a crossover switch south of the Federal Triangle Station in D.C., and the car was pulled sideways and it crashed into the concrete pillar separating the inbound and outbound subway tunnels. A misaligned switch at Smithsonian Interlocking caused the rear wheel truck to derail, and the wheels tracked alongside of the rails for 171 feet, following the opposite track, until the car impacted the concrete pillar. There were 3 fatalities, and 25 injuries. Investigations identified human operational error as the primary cause. This occurred on the Blue/Orange Line, and resulted in the both lines being shut down. 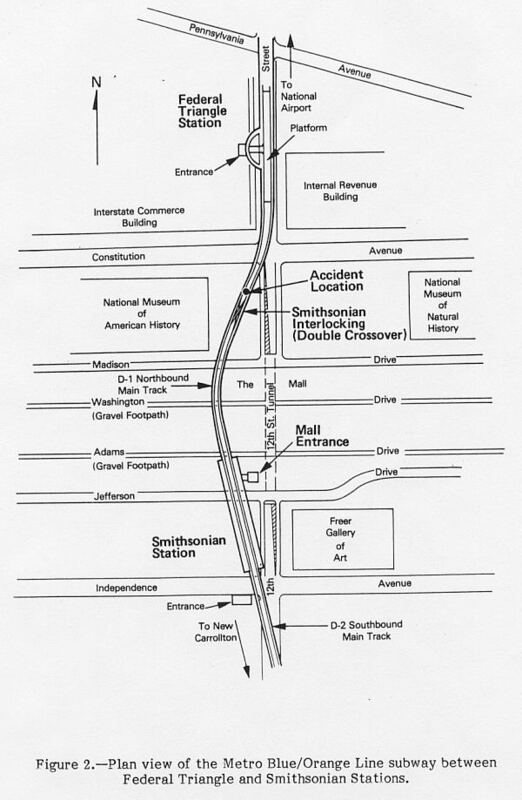 At that time, the Blue Line ran from National Airport Station in Arlington to Addison Road Station in Maryland, and the Orange Line ran from Ballston Station in Arlington to New Carrolton Station in Maryland. The derailment occurred on the section where the two lines share the same cross-town subway route, and the wrecked subway car blocked both tracks. The other (then) open line, the Red Line, was not affected. 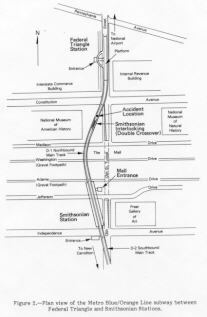 Map showing Metrorail accident location, from NTSB accident report. Click for larger photo image: Large (84K). So in a one hour period, the D.C. area lost the use of its (at that time) busiest airport, busiest expressway, and busiest subway line. The (by far) widest/busiest bridge from D.C. to Virginia closed, and the one rapid rail transit line from D.C. to Virginia closed. This was a true area-wide transportation disaster, a major chunk of the air, highway, and rail system closed. From "Series of Disasters Paralyzes Capital Area at Rush Hour", The Washington Post, January 14, 1982: "The series of disasters locked tens of thousands of commuters in a monumental traffic jam yesterday afternoon and into the night. Scores of drivers, confused and frustrated that their normal routes home were blocked and bridges snarled with traffic, simply walked away from their cars. Many motorists waited in bars and checked into Washington hotels. The 14th Street Bridge, the major traffic artery into the city from Virginia, will be closed today while officials continue their investigation, salvage and damage assessment efforts in the wake of the airplane crash. Inbound traffic on I-395 will be funneled over Memorial Bridge. Metro officials explained that the Blue and Orange Lines, which carry traffic into the city from Virginia, will terminate at McPherson Square. The same lines bringing passengers into the District from New Carrolton and Addison Road in suburban Maryland, will end at the Federal Center Southwest Station. Busses will be used to ferry passengers between McPherson Square and Federal Center Southwest while crews work on the damage to the line near the Smithsonian Station". The subway accident had no connection whatsoever with the air crash. The snowstorm put increased passenger loads on Metro, but that is a casual factor at best for causing the derailment. Due to the proximity of the air crash to the airport, and due to the fact that National has only one jet airliner runway, it closed at 4:28 PM and didn't reopen until 7:00 AM the next morning. The 14th Street Bridge spans were used as a staging area for salvage and support operations for the crash site, and it was about two weeks before the complex was fully reopened, although the southbound span reopened a day after the crash, and the repaired northbound span reopened 3 days after the crash. A temporary repair to the Rochambeau Bridge was effected where the plane hit and ripped out about 100 feet of parapet. Due to the sub-freezing weather and heavy ice conditions on the river, it took two to three weeks to retrieve the aircraft wreckage and fatalities from the river. The water is 25 to 30 feet deep where the plane crashed, about 150 feet from the south shoreline. The removal of the demolished subway car from the subway tunnel was difficult. It had to be taken apart and taken out in pieces. The destroyed tracks had to be rebuilt. The accident occurred at an interlocking (crossover) section of line. It took 5 days for the subway tunnel at the accident site to be reopened to train service. During the period of closures of the subway tunnel and the 14th Street Bridge, there were major traffic and transit jams. Ten-mile-long peak period backups were common on some major thoroughfares. Some trips that ordinarily took 40 minutes by auto or transit, took 3 to 4 hours, and peak periods stretched far beyond normal peak period times. The snowstorm on the day of the disasters dropped an average of 6 inches of snow, and many places got 4 more inches by the next morning. Snow removal was complicated by sub-freezing temperatures and generally bad traffic conditions. See my 14th Street Bridge Complex (I-395 and US-1) article for detailed information about the bridge complex. The Rochambeau Bridge was later renamed the Arland D. Williams, Jr. Memorial Bridge, after the heroic Flight 90 passenger who perished while saving others from the icy waters. "He was about 50 years old, one of half a dozen survivors clinging to twisted wreckage bobbing in the icy Potomac when the first helicopter arrived. To the copter's two-man Park Police crew he seemed the most alert. Life vests were dropped, then a flotation ball. The man passed them to the others. On two occasions, the crew recalled last night, he handed away a life line from the hovering machine that could have dragged him to safety. The helicopter crew - who rescued five people, the only persons who survived from the jetliner - lifted a woman to the riverbank, then dragged three more persons across the ice to safety. Then the life line saved a woman who was trying to swim away from the sinking wreckage, and the helicopter pilot, Donald W. Usher, returned to the scene, but the man was gone," from "A Hero - Passenger Aids Others, Then Dies", The Washington Post, January 14, 1982. 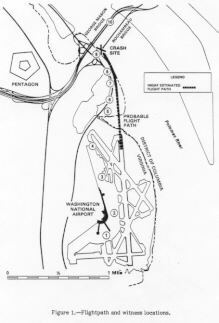 Sources: National Transportation Safety Board (NTSB) accident reports for the two accidents (NTSB-AAR-82-8 and NTSB-RAR-82-6), plus articles from The Washington Post, January 14 to 20, 1982. See also the Aviation Safety Network, Aircraft accident description 13.01.1982 Boeing 737-222. See also Andrew Ayers' webpage for the Flight 90 Crash. See also AirDisaster.Com, Special Report: Air Florida Flight 90.